Martha and Charlie are very different. Charlie believes in uptown conventionality and three-piece suits. Martha lives downtown in a neighborhood her parents refuse to visit, afraid they would never get a cab back to the Colony Club. Martha and Charlie are also very much the same. Neither of them expected to be divorced. Neither of them expected to be the single parent of a teenaged child. Neither of them has the slightest idea how complicated it is to fall in love when both are accompanied by twenty years worth of excess baggage.Charlie is the lawyer who represented Martha’s husband against her in their divorce. It was the saddest, most bitter time of Martha’s life, and she would have been glad if she had never heard Charlie’s name again. When ex-husband Raymond then dies in a plane crash, Martha finds not only that she has to hear his name, but that Raymond has left his estate to their sixteen-year-old son, Jack, and Charlie is the executor. 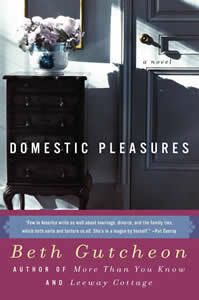 In Domestic Pleasures, Beth Gutcheon creates a complex universe in which the reader can see, finally, that even in domestic matters, even in the undramatic choices of raising their children and conducting their marriages and living their lives, her characters affect the lives and happiness of each other in chains of related events far beyond what they can see themselves. It makes for rare reading pleasure-funny, touching, and romantic.